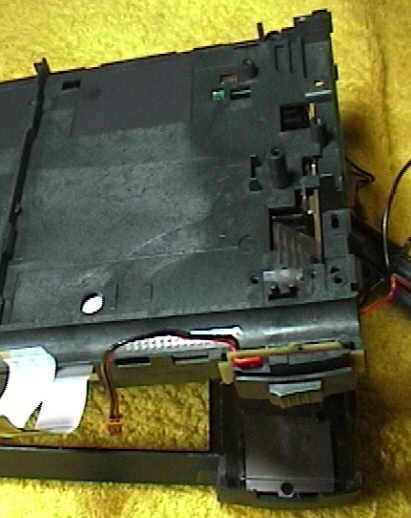 So you want to take apart your trusty old MessagePad 2000 or 2100? Good luck! Doing this is not for the faint at heart. 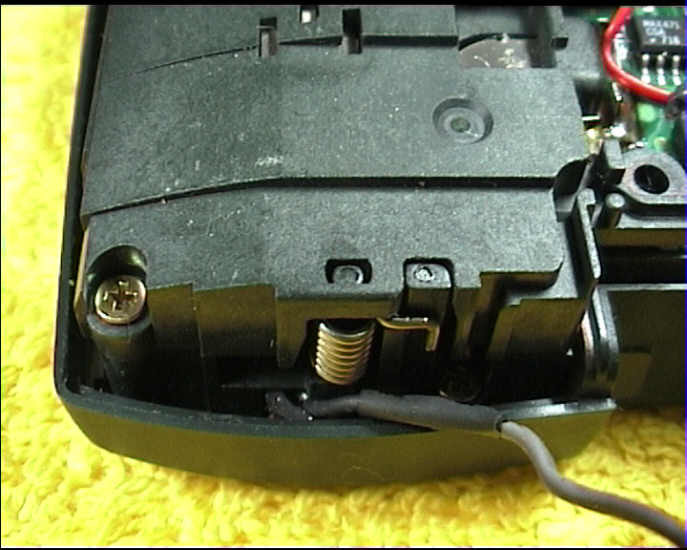 But if you follow the instructions below closely, you have a good chance not only to take it apart successfully, but also to reassemble it in a way that you will have a working Newton afterwards, without any leftovers whose initial position in the Newton assembly you seem to be unable to recall. Click on the images to get a higher resolution image in a new browser window. If you are already sure you will have to take the Newton apart, for example because the display is broken, let’s try to save some of your data first. If it is still intact and you can still get a serial connection to your desktop (you wouldn’t need the display for that), you might want to consider downloading DataRescue (5 kB) before you begin. This little package does nothing but automatically open the Dock and wait for your desktop machine to make contact. You will then be able to back up your data to the desktop computer using the Newton Backup Utilities (PC version or Mac version) or similar software. DataRescue does so when it is installed, i. e. when a card is inserted or the eMate is reset. In an emergency case like yours it can be installed on a card via a second eMate or an Apple Newton MessagePad. 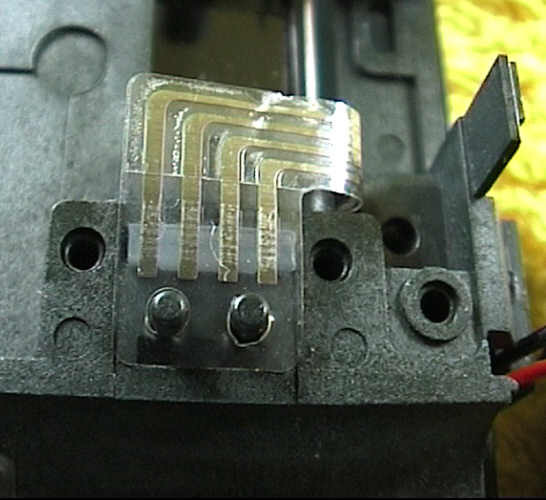 If your Newton’s problem is not a broken display, make sure that this kind of surgery is really necessary. Check the power supply. Make sure your power adapter works. “Works” in this context means around 7 volt at the plug that goes into the Newton. Don’t continue if the voltage isn’t at least 6 volt. NEVER continue if the voltage is more than 7.5 volt because you can very easily kill your Newton that way. Remove the battery. Plug in the ac adapter. Normally the Newton should now power up and tell you that the system rebooted because all power was interrupted. If it does: Congratulations! Nothing? Well, don’t despair just yet. There are still some aces left to play. We will now enter the wonderful world of resets. Don’t run head-first into a wall if the Newton still seems unwilling to come back to life after one of the four reset types described here. Apple says in a tech note that this might take up to two minutes. I have heard of cases where it took more than five minutes. When performing a system reset, you risk losing some information entered on your MessagePad, and you will need to reset your clock and calendar information. I think you will also lose what the Newton has learned about your handwriting. Remove the battery. Unplug the power adapter and leave the Newton alone for a few hours. If I were you, I would leave it alone for a day. 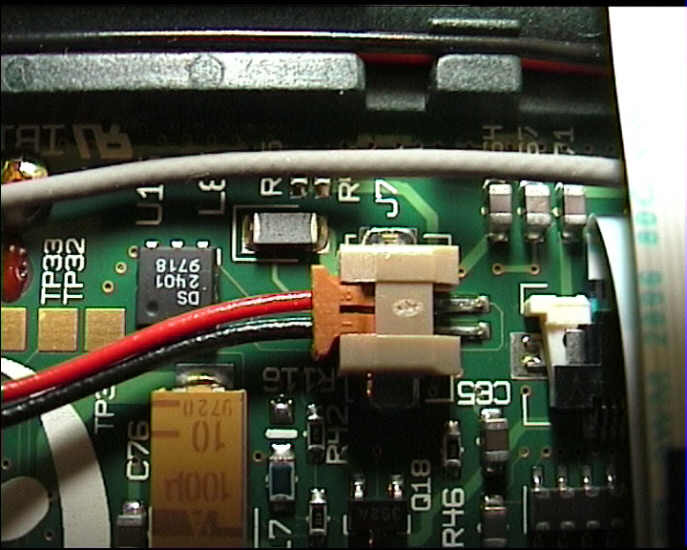 The Newton 2000 / 2100 models have a gold capacitor that plays the part of the backup battery earlier Newton models have. Basically this is a capacitor with a very high capacity that can back up your Newton’s memory for at least the time it takes you to change the battery. In most cases it can back it up for a much longer time. After a day, plug in the power adapter again and pray. When performing a hardware reset, you risk losing the information most recently entered on your MessagePad. Press and hold down the reset button for twenty seconds. At some point the Newton will chime and power on. When it does, release the reset button. The screen will go blank and the Newton will power on again. A hard reset erases all data and information in the Newton’s internal memory. This includes applications that were installed when you bought the Newton (like the Handwriting Instructor, the Newton Tour or Newton Works), and also all applications you installed later. It also erases all information you have stored, such as name cards, notes, calls and date book entries. It will not remove the built-in programs, the operating system or installed system updates. I honestly hope that you have a very recent backup. If you don’t, rest assured that from now on you will. Press and hold down the power switch , then press and hold down the reset button for two seconds. Release the reset button. Continue holding down the power switch until a message appears that asks you if you really want to erase all data. Tap “Yes”. When you see a second message asking you if you really want to continue because you are going to lose all data, tap “Cancel” for now. 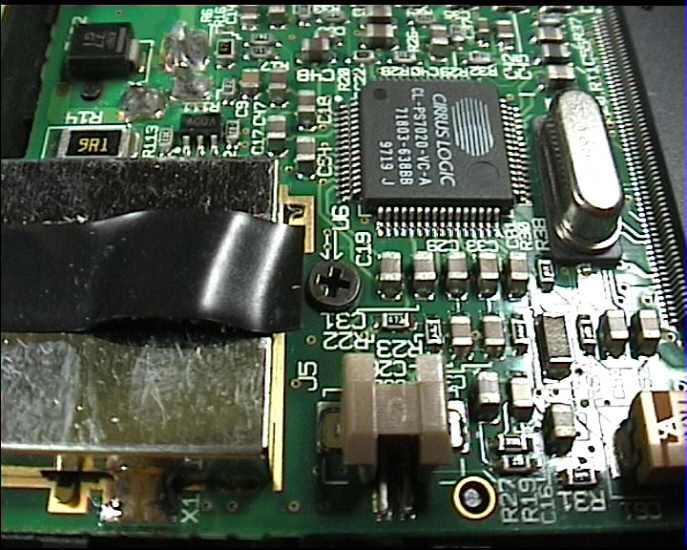 If the Newton powers up, do a full backup and repeat the hard reset, this time allowing the Newton to erase all data. What you are going to do now will take place very close to delicate electronic parts. 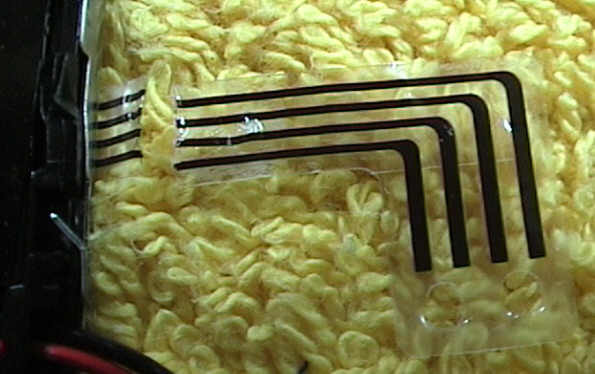 Something that will definitely make these parts very angry is their getting in touch with static electricity. Clothes made of synthetics can be a problem, so can office chairs on a carpet. Humidity plays a role, too. Working in a room with a wood or tiled floor in which the air is not too dry, and wearing clothes that aren’t made of synthetics, are your first steps towards a safe reunion with your beloved Newton. Make sure to discharge yourself frequently before touching it. About the best way to do this is by wearing a grounded wriststrap. If you don’t own one, touching a metal faucet or any large piece of metal (like a door, bed frame etc.) frequently will also help. The same applies to your soldering iron. 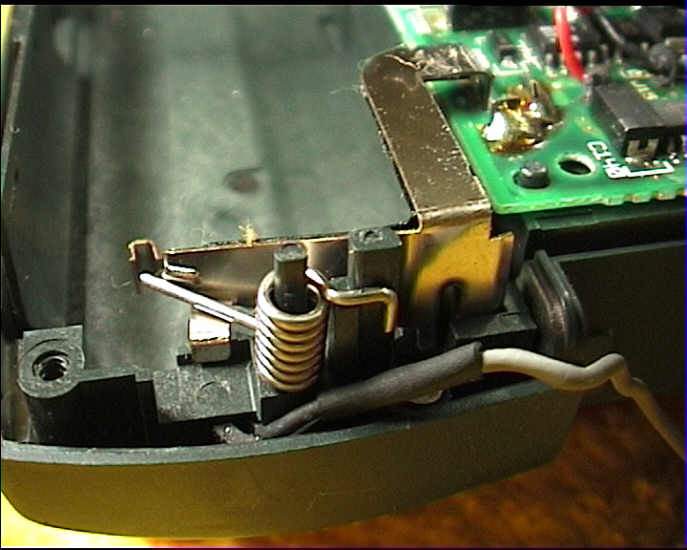 Unless you have a soldering station with an extra grounding wire, it won’t hurt to discharge the tip as frequently and in the same way as yourself. 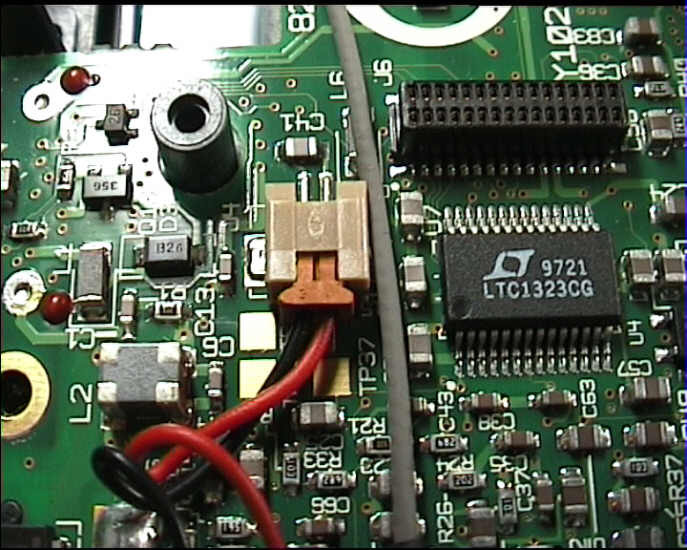 The good news is that in order to take the Newton apart you can leave your soldering station switched off. Small parts like the 18 screws you are going to remove have a distinct urge to explore their surroundings as soon as they get the chance. They enjoy doing so especially when they smell carpets, preferably long-fibred ones. The frequency of a given part’s attempted jumps is in inverse proportion to its size. And, no matter where it lands, it will always manage to hide even when there is nothing whatsoever to hide behind. And of course, you will never (if at all) find it anywhere near where you are sure you heard it end up, if you find it at all. You might want to print some of the pictures below, or you could draw rectangles on a blank sheet and mark them with the numbers and names mentioned here. Remove each screw or other small part carefully and tape it to its respective rectangle. Using a magnetized screwdriver will prevent screws from setting up their own business. If you think you do not have a magnet to magnetize your screwdriver with, you are probably wrong unless you don’t have a single loudspeaker around. 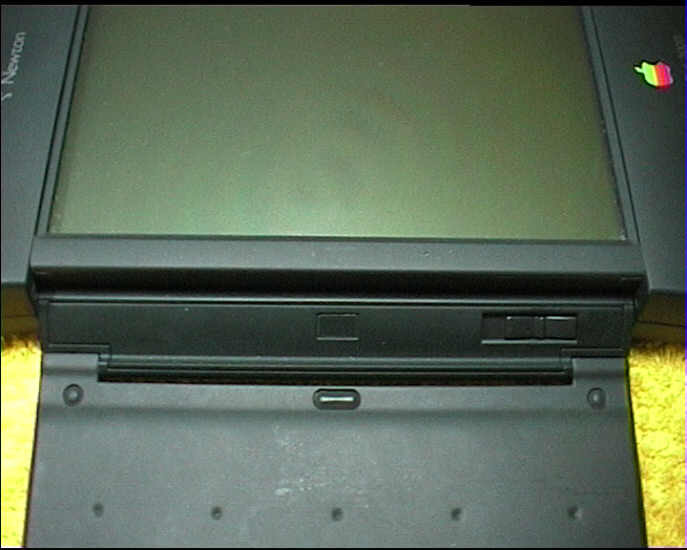 Remove the battery, the stylus and the cards in both PCMCIA card slots. Slide the screen cover unlock lever A to the left while pulling the right side of the screen cover towards you. Move the cover slightly to the right to release its left side and put it in a safe place. Now comes the hardest part: Removing the bottom half of the case. All in all the two halves are held together by eight catches, each marked by a magenta rectangle. 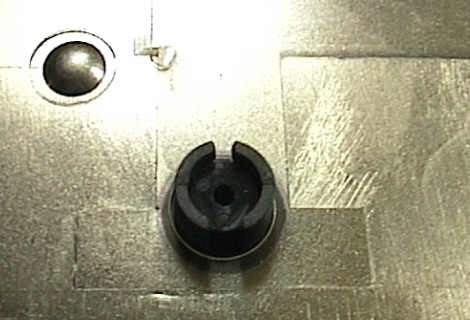 Using a fingernail, a knife or a small flat-blade screwdriver, apply pressure to the catches while pulling the two halves apart. Start with the three catches at the right side. Then work along the top and bottom sides towards the left side. This is not very difficult to do again if you have done it before. If this is your first attempt, be careful and, no matter how often you fail, resist the temptation to tear the bottom of the case off whilst shouting words your mother has always told you not to use. On the part of the case that you just removed, all catches (except for the two on the left side in the picture above) look like those shown here. I would now like to introduce you to a couple of parts that have the annoying habit of starting to explore their surroundings as soon as you take your eyes off them. The little fellow shown in the left picture is what is between your pen and the reset switch. Normally in has its lodgings in the bottom half of the case as shown in the right picture. Push it out from the underside and put it in a safe place. The case snap. This thing normally lives next to the power switch. 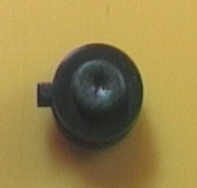 The IR lens. It is located at the bottom left corner. 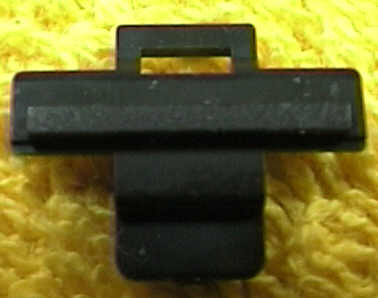 The modem connector blank. You will find it slightly above the IR lens. 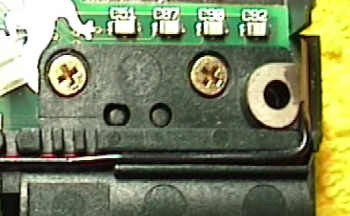 Unplug the loudspeaker connector J4. Unplug the microphone connector J5. 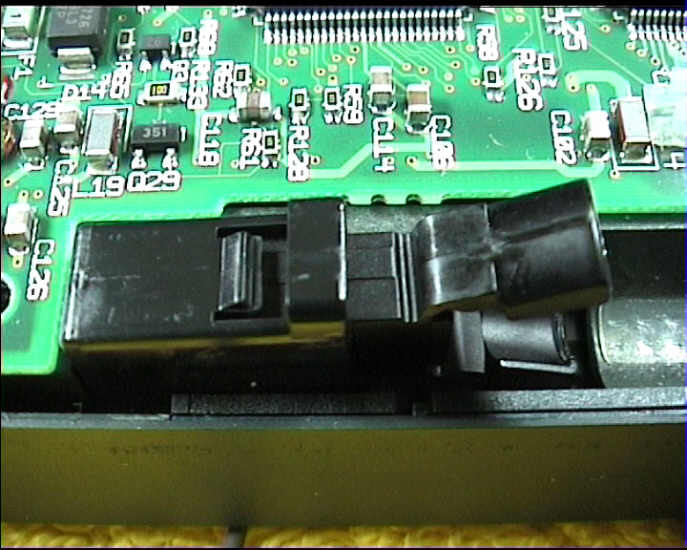 Unplug the power switch connector J7. Unplug the backlight connector J13. 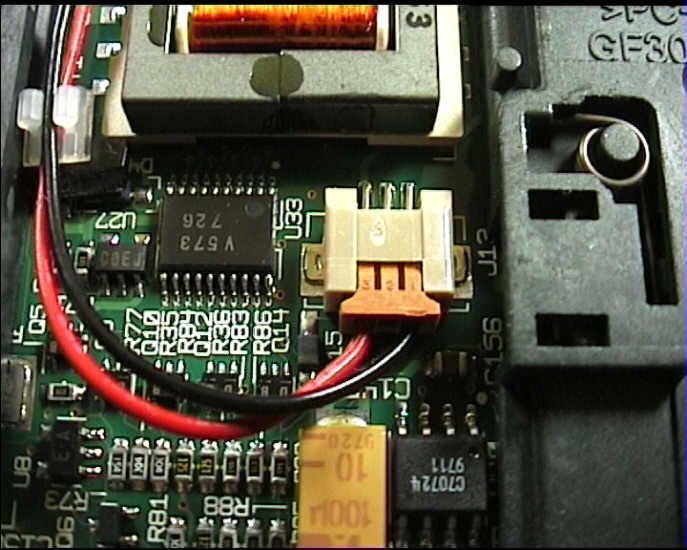 Unlock the display ribbon cable connector J9 by pushing the two white tabs outwards towards the cable. Free the display ribbon cable. Using the 1x4 cross-point screwdriver again, remove screws 5 to 8. 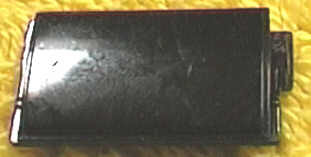 Remove the stylus cover and place it as shown in the picture. Thread the backlight wires out and put the stylus cover away. 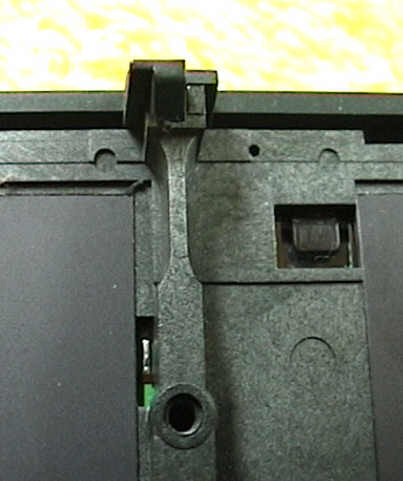 Remember the position of the stylus spring catch and remove it. 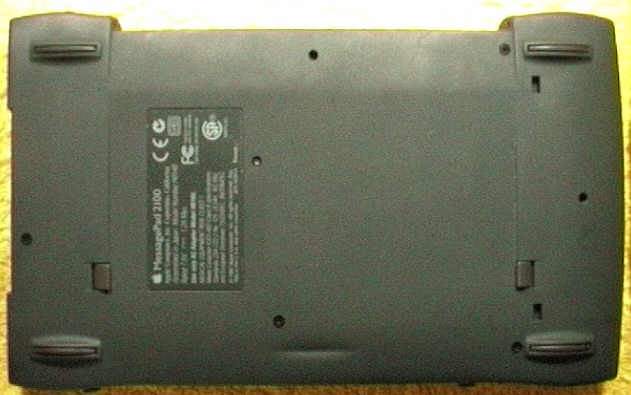 There are five catches that hold the bottom half of the battery case. Push the battery case half towards the left (away from the MLB) while gently tilting it up at the MLB side, then pull it towards the MLB to release the catches. Put the battery case half on the main logic board. 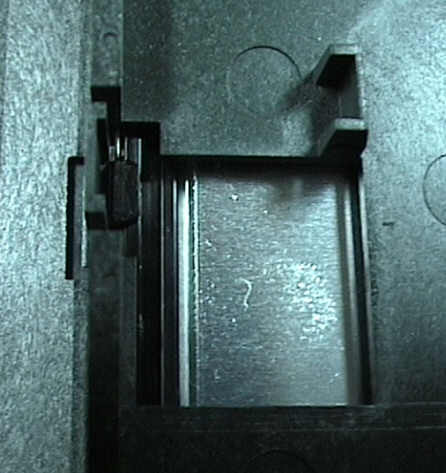 This is the spring that is responsible for a safe contact with the negative terminal of the battery. Memorize its position and remove it. Remove screws 10 and 11. The catch shown here (henceforth called catch B) is now all that secures the MLB. 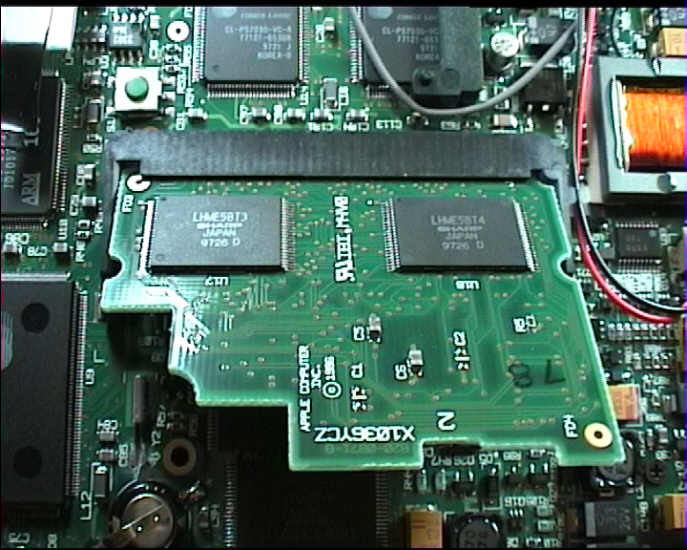 Press it outwards and tilt the main logic board up at the left (battery) side. 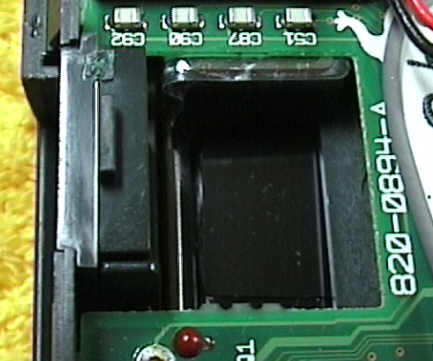 Gently remove the MLB along with the battery case half that is connected to it by two wires, wrap it in aluminum foil and put it in a safe place. Make sure to leave the fragile card slot mechanism intact. Congratulations! With the MLB safely out of the way, you can now remove another six screws. 12 and 13 are very tiny ones. 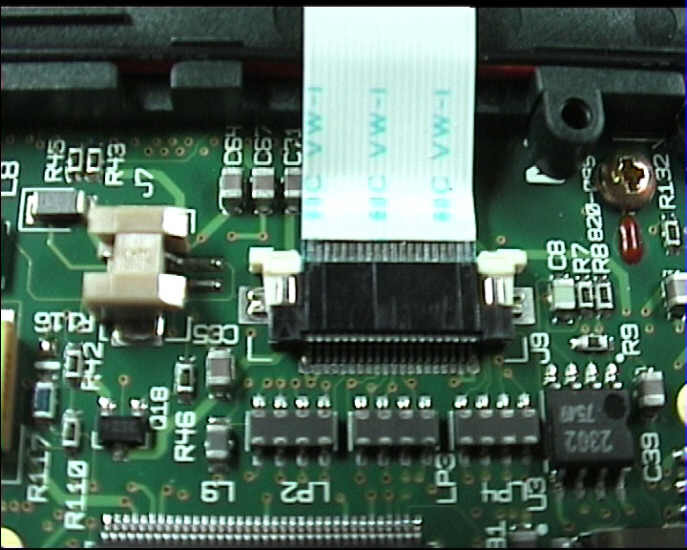 What you see here is the touch screen (digitizer) cable. Which does not at all mean that it would be a good idea to touch it. Touching it with your bare fingers would in fact be a very bad idea that you’d regret ever after. Using a small screwdriver, gently pry it off the two pegs. And if I say gently, I mean gently. You will work against a thin layer of glue, and this thing is very easy to tear. ... and tilt the display assembly up. Move it to the right to release the three catches at the battery end. Remove screw 18 and flip the display assembly so that it lies bottom-up. 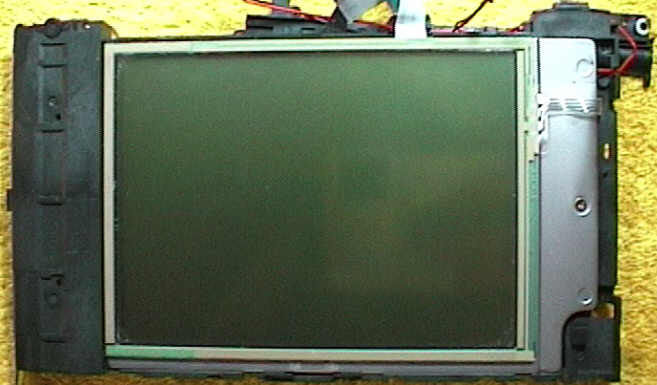 Put something beneath the battery end of the display assembly so that it lies slightly tilted. There’s yet another catch that is released by pressing the lever marked by the magenta rectangle. While doing so, press gently in the square area to the right of it, this will push the display unit down. Remove the display unit. Hopefully, I will be able to fix this under a microscope tomorrow. Until then: No beer, no wine, no single malt whisky. Fixing Newtons does have it drawbacks. 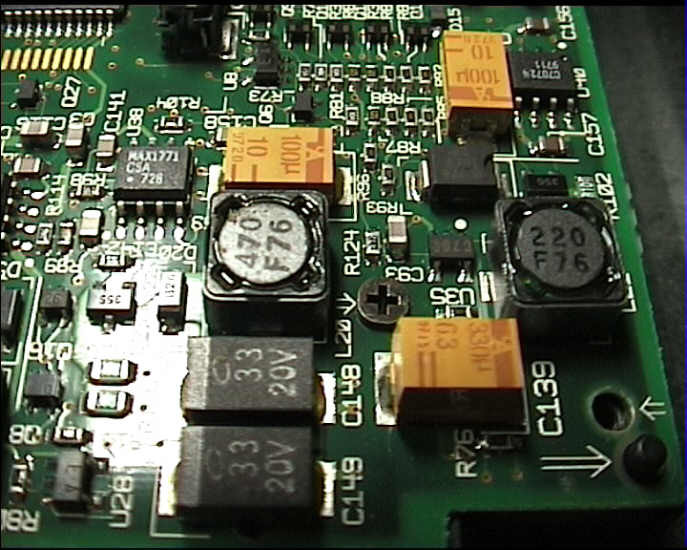 When soldering under a microscope, steady hands are mandatory. Dead links? Questions? Anything unclear? Any syntax or grammatical errors in this description? Feel free to tell me about it. Yes, really. Don’t be polite, be helpful. If you aren’t, how am I supposed to improve my English?